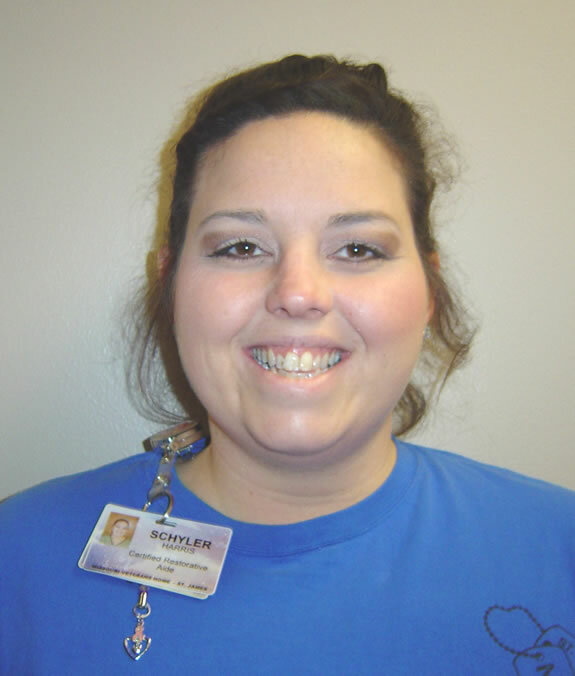 Schyler Harris, Restorative Aide for the Missouri Veterans Home – St. James, was selected as the March 2019 Missouri Veterans Commission Employee of the Month. Schyler was nominated by her peers and selected because of the way she is always creating moments of joy for Veterans, staff and volunteers. Schyler is always smiling, happy-go-lucky, and encourages the veterans to come in and do their daily routines to improve the quality of their lives, helping them be as active as physically possible. The Veterans love her dedication and infectious energy. She is able to get even the most reluctant Veteran to exercise, tailoring her schedule to meet their needs. Schyler serves extra hours and shifts in nursing while still maintaining her Veteran's restorative therapy program and this dedication has been a part of Schyler's service since she started at MVH-St. James six years ago and has never wavered. While employed with the Missouri Veterans Commission Schyler has day after day exemplified true dedication to the Commission's Mission Statement of honoring and serving our Veterans. She is a true role model for all Commission staff and her dedication for those we serve reflects well on the Commission as a whole and on herself in particular. Schyler will be honored April 4, 2019 at a 2:30 p.m. ceremony at the Missouri Veterans Home – St. James in St. James, Missouri.